Once the pool opens we will be open weekends only through May. We will open daily starting June 1st. Make sure to get your new club membership cards. It’s important to review the pool policies prior to coming to use the pool. Glenbrook residents that are in good standing and over the age of 14 are eligible to apply for a club membership card. Children ages 7 –13 will be given special membership cards. Their card will allow them on the pool deck but NOT allow them to bring guests. Renters are required to present a utility bill with their name and Glenbrook address. To apply, fill out the Membership Card Request Form at the club and send it along with your dues payment or drop it off at the club. Please include all birth dates of members under the age of 18. The homeowner must sign and date the bottom of the form. 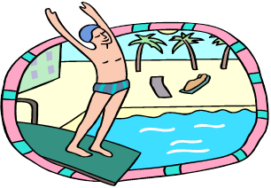 Membership cards are not made until you come to use the pool for the first time. Homeowners’ accounts must have a zero balance before cards are issued. You are required to show your membership cards every time you are use the pool so hook them to your pool bag. If you should lose your card you will have to pay a $2.00 replacement fee.